24th August to 13th September 2008. - The group has raised £31,541, and the trip itself was self-financed. 11 students and recent graduates arrived in Rishikesh and stayed at the Paramath Ashram. Voluntary work was undertaken in teaching and food serving. They spent two days at Divya Prem Sewa Mission, teaching and interacting with the youth. 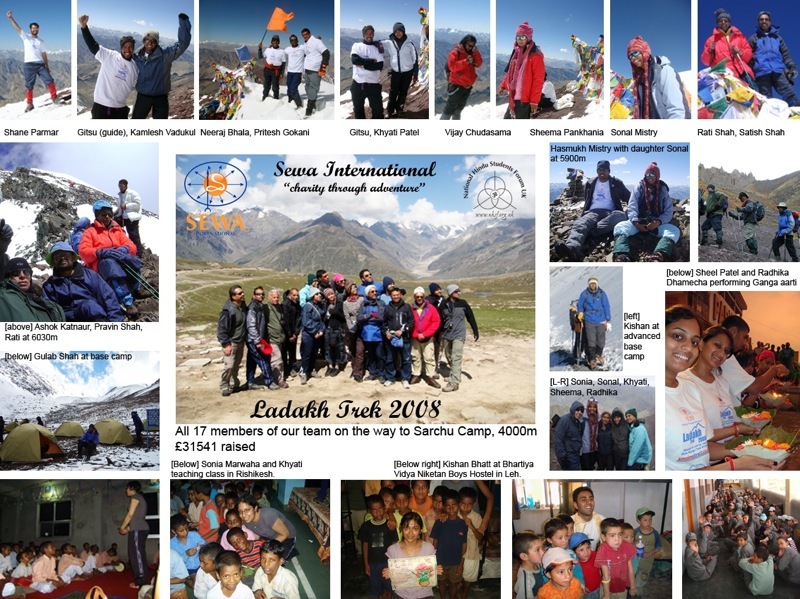 17 participants arrived in Manali, altitude 2000m, after a tiring 16 hour journey. We visited two ancient temples of Hidamba ( wife of Bhim ) and Vashistha Kund (Kul Guru of Raghu Dynasty in Ramayan ) which has a hot spring pool. Day 3 – Crossed over Rohtang Pass 3985m, to Jespa 2550m for the night. Day 4 – Crossed Baralacha Pass 4650m to Sarchu 4300m. Sarchu was cold, having spent the night in tents. Day 5 began with snow fall and poor visibility. We made a late start crossing Lachulung La Pass 5065m and Taglang La pass 5317m, arriving safely in Leh. Day 6 – Met Sewa officials and visited a nursery school, a primary school, and a boarding school. We were fortunate to perform Sindhu Darshan on the Sindhu River (river Indus). Our Hindu name was given by foreigners based on the ancient civilisation in the Sindhu river valley. The temperature in Leh was cool at an altitude of 3500m. This part of the trip was also for essential altitude acclimatisation. Day 7 – Commenced trek to Rambuk Village, 3500m, a gentle 6 hour walk. The village is entirely eco friendly. En route we met a large group of 35 trekkers from Scotland. Day 7 was a steep challenging 8 hour walk, crossing over Stok La pass 4900m and stopping at Lower Stok La range, 4200m, for the night. Day 8 was relaxing with a gentle acclimatising walk to the near by hills. In the late afternoon it started to snow heavily and the students and our guides engaged in a lively snowball fight. A couple of our group members were feeling mild altitude sickness. Day 9 – Made an early start to the Stok Kangri base camp 5000m. 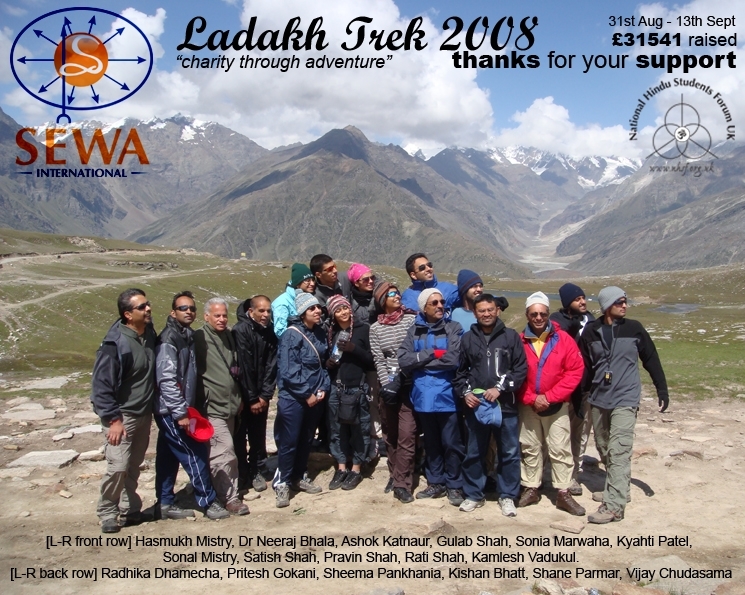 Unfortunately, 1 member of the group decided to return to Leh due to severe altitude sickness. In the late afternoon we walked up to 5250m. Day 10 – arrived at Advanced Base Camp 5300m to witness a beautiful sunset. It was very cold and after some food we retired early to our sleeping bags. It was a success as all 16 spent the night at such a high altitude. Day 11 – As this was the summit day, wake up call was at midnight and 15 of us set off at 01.00am, well wrapped up and slowly inching forward by torch light. The air was thin and at around 5600m 2 members retired due to extreme cold. The rest were pushing forward and Shane Parmar was first to summit just after 8.30am. He was followed by 9 others including pensioner Rati Shah at the young age of 66. Another 3 made it to 6030m. Everyone arrived safely back to the camp. Day 12 – 7 hour walk to Stok village and drive to Leh. In the evening we met up with local Sewa volunteers for prayers and a celebration dinner. Day 13 – Early flight to Delhi, followed by a visit to a local Sewa project, a multi purpose centre near a large slum. The centre has a medical dispensary, crèche, nursery, and classes in sewing, makeup, beauty, computers etc. Next we visited Matru Chhayaa, a centre where newly born abandoned babies are provided with loving care and attention and then adoption with families is organized under strict conditions and rules for the adoptee family. Next we visited another learning centre in a large slum by the railway line. The whole trip was an eye opener to Sewa charity work and its dedicated volunteers, and an ultimate personal endurance challenge climbing Stok Kangri.